Christmas is coming!!! I am a fan of all things Christmas related, but I'll be honest with you, the one tradition that we have not taken up is the Elf on the Shelf. I don't know why, it just doesn't seem like something that would suit our family. But I've seen these sweet little elves around for the past couple of years, and they're a little bit different, they are just what we've been looking for. We have got a lot of Christmas traditions, but none are quite like The Kindness Elves. The Kindness Elves are so different to all of our other traditions, they're not about more gifts and goodies for my kids, they're all about sharing with others. There is also no pressure to do them a certain way, you can make their routine suit your family. Maybe they will be there every day in December, maybe just the 12 days of Christmas or maybe just a few days here and there, it's completely up to you. 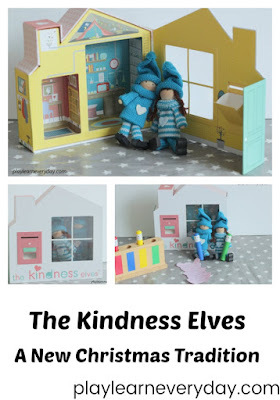 The Kindness Elves arrive in the cutest little box, which opens up to reveal their little house. There are two Kindness Elves in each set, a boy and a girl. You can choose from different coloured clothing and skin tones for your set. Once they arrive, the fun begins! Our Kindness Elves arrived with a note asking Ethan and Ivy to collect some of their old toys to give to charity. They were holding some baby toys with the note, which made it easier for Ivy (who hasn't learned to read yet) to understand what it was they were asking of her. The children happily set to work straight away, taking their Kindness Elves with them (there are no rules about not being able to touch these little elves, they're also really fun to play with!) and collecting lots of our old baby toys that they no longer play with and putting them into bags. In our house I think that The Kindness Elves probably won't come every day, especially as we've started a bit early, but I do have quite a few other ideas, which I think that the children will be very good at helping out with, and which will help them to understand how wonderful it is to be kind to people and how it makes you feel when you share and help others. We will definitely be collecting some of our old winter clothes to donate to charity, we will also be baking for neighbours and friends. It also gives us a chance to do so many of the things that we see, but never get around to doing. I'm keeping a list of all these different charities and campaigns and really hoping that we can get to them all. Not all of the ideas need to take a long time, Ethan's school have mentioned that they need more tissues as it's cold season, so one morning the children will find The Kindness Elves surrounded by tissues and they'll just have to go to the cupboard to pick up a few boxes for school. We would love some more ideas, and to know what you've been doing with your Kindness Elves too!